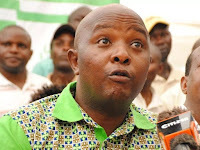 Tuesday September 11, 2018 - Defiant ANC nominated MP, Godfrey Osotsi, has dared his party leader, Musalia Mudavadi, to expel him from the party and stop threatening him. Speaking yesterday, Osotsi said ANC should make good its threat to kick him out and recall him from Parliament. “We are asking questions that we want answered for our people,” Mr Osotsi said. This came after Sabatia MP, Alfred Agoi, warned on Sunday that ANC MPs and Ward Representatives who openly defied Mr Mudavadi will be dismissed from the party and lose their seats in the National Assembly and the County Assemblies. Others being targeted for expulsion for defying Mudavadi and supporting ODM leader are Senators Cleophas Malala (Kakamega) and George Khaniri (Vihiga).